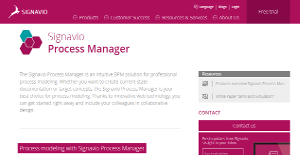 What is Signavio Process Manager? Signavio Process Manager is a simple and straightforward business process management platform built to allowing business people to capture, design, and enhance their business. The software captures, links, and explains how work is done and where decisions are made then brings that information to the Collaboration Hub. The transparency of the processes and decisions across your organization will impact your decision making in a positive way, helping you make better decisions, faster. This software is created to address professional process modeling requirements, enabling you can to build current-state documentation or target concepts. Signavio Process Manager has proven to be a reliable and optimum best choice for process modeling. Integrated with innovative web technology, you can work right off the bat and collaborate with your colleagues in creating the best designs and processes for your business. Signavio Process Manager helps you look into your business processes and identify areas that can be further optimized, changed, and improved upon so that your overall business productivity and efficiency are dramatically enhanced. This business process management tool allows you to fully leverage the best practices of today, along with interfaces and devices so you can achieve customer excellence. With Signavio Process Manager, you can create new business processes and streamline existing ones based on reliable and actionable insights. Signavio provides business decision management capabilities that greatly optimize the processes involved in making critical business decisions. The software allows you to see decisions context of overall process management and grants you absolute control of your end-to-end decision management. With the SAP Solution Manager functionality, Signavio users are able to leverage the interface between SAP Solution Manager and Signavio, which is great if you want to get your colleagues involved in all phases of your projects. Integrating Signavio Process Manager with leading third party applications is not a problem. The software is built with extensive Mashup- and REST-APIs tools, integration with lightweight Add-Ons and APIs is smooth and seamless. If you want to quickly and accurately identify activities that drive cost or need to experiment with cycle times, Signavio Process Manager gives you the ideal conditions. If you are interested in Signavio Process Manager it may also be sensible to analyze other subcategories of Best Business Process Management Software listed in our database of SaaS software reviews. There are well-liked and widely used applications in each software category. But are they essentially the best fit for your organization’s special wants? A market-leading software product may have thousands of users, but does it offer what you require? For this reason, do not blindly spend on popular systems. Read at least a few Signavio Process Manager reviews and mull over the aspects that you want in the software such as the fees, main functionality, available integrations etc. Then, shortlist a few solutions that fit your wants. Check out the free trials of these apps, read online opinions, get clarifications from the maker, and do your homework systematically. This profound groundwork is sure to aid you select the best software solution for your company’s specific needs. How Much Does Signavio Process Manager Cost? We realize that when you make a decision to buy Business Process Management Software it’s important not only to see how experts evaluate it in their reviews, but also to find out if the real people and companies that buy it are actually satisfied with the product. That’s why we’ve created our behavior-based Customer Satisfaction Algorithm™ that gathers customer reviews, comments and Signavio Process Manager reviews across a wide range of social media sites. The data is then presented in an easy to digest form showing how many people had positive and negative experience with Signavio Process Manager. With that information at hand you should be equipped to make an informed buying decision that you won’t regret. What are Signavio Process Manager pricing details? What integrations are available for Signavio Process Manager? If you need more information about Signavio Process Manager or you simply have a question let us know what you need and we’ll forward your request directly to the vendor.